Bayview is a family oriented marina. If you’re up early, you can enjoy not only the peace and quiet that is an integral part of the morning but the beauty of the sun as it rises over the bay to start a new day. Bluffs Bar, Pottahawk Point, Long Point Lighthouse, Turkey Point and Port Dover are boating destinations close at hand. For those days when you decide to just “hang out” at your boat, there is a playground designed like a ship waiting for the imagination of any child to sail the seas in search of swashbuckling pirates. If you’re looking for a little exercise, grab a basketball and you can shoot a few hoops or challenge a fellow boater to some one-on-one. For those who want a slower pace and some competitive fun, why not drag your neighbour over to the pits and get a game of horseshoes going. And, always at the end of the day are the lure of a campfire and the company of fellow boaters. 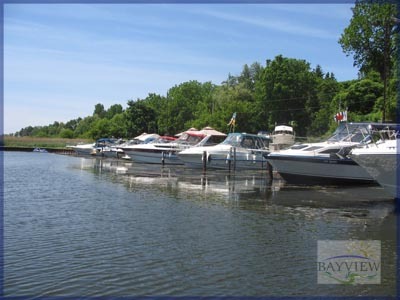 Come to Bayview and discover for yourself why our customers return every year to make Bayview Harbour their home port and “summer sanctuary”.